State health officials said on Friday that a one-year-old in Pima County has been diagnosed with measles. 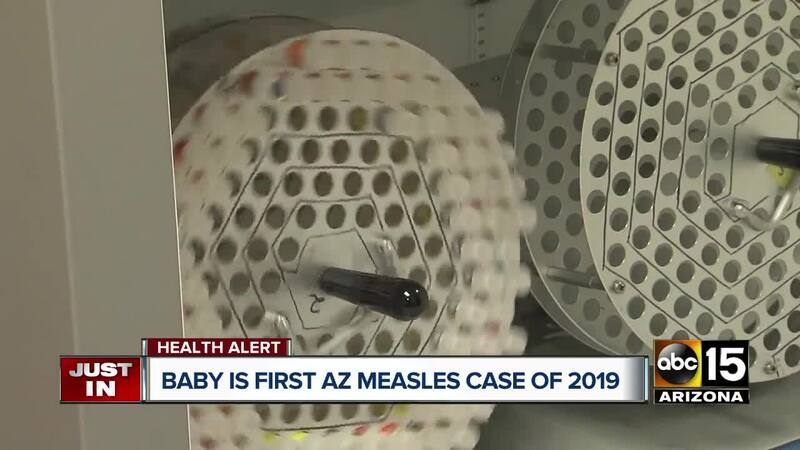 PIMA COUNTY, AZ — State health officials said on Friday that a one-year-old in Pima County has been diagnosed with measles. The Pima County Public Health Department and the Arizona Department of Health Services are working to determine if there was any community exposure to the disease. The confirmed case is in an infant with Asia-related travel, officials said. "We are working with our healthcare and public health partners to make sure we quickly identify any possible exposures to the community that may have occurred," said Marcy Flanagan, Director of the Pima County Health Department. "As more and more cities and counties across the United States experience cases of vaccine-preventable diseases like measles, we are working hard to prevent that from happening in Pima County." Measles spreads through the air when an infected person coughs or sneezes. Measles symptoms appear seven to 12 days after exposure but may take up to 21 days to appear. It begins with a fever (101 F or higher), red, watery eyes, cough, and runny nose and is followed by a red rash, raised, and blotchy. The rash begins on the face at the hairline and moves down the body and may last five to six days. Measles can be prevented with the MMR vaccine. The vaccine protects against three major diseases: measles, mumps, and rubella. Earlier this week, two cases of mumps were confirmed in Maricopa County, including one at Hamilton High school in Chandler. "We know that infectious diseases are just a plane ride away," Dr. Cara Christ, director of the Arizona Department of Health Services. "Measles is a serious and highly contagious disease that can spread quickly. We recommend that everyone is vaccinated against measles to help keep our communities safe."